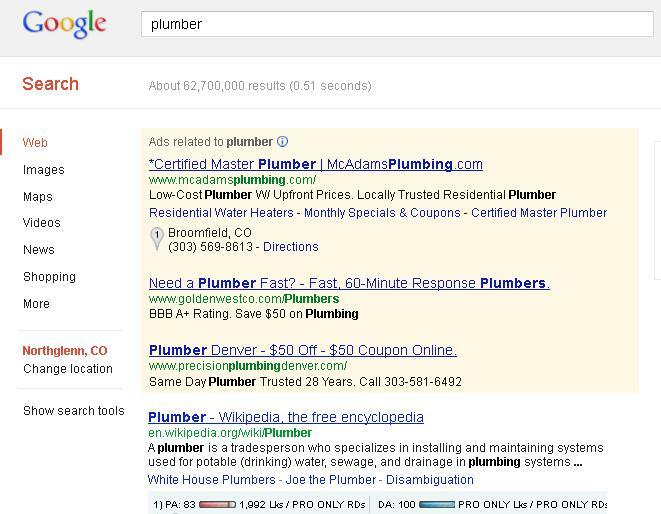 Why Google’s Geo Targeting in Local SEO is a Mess! 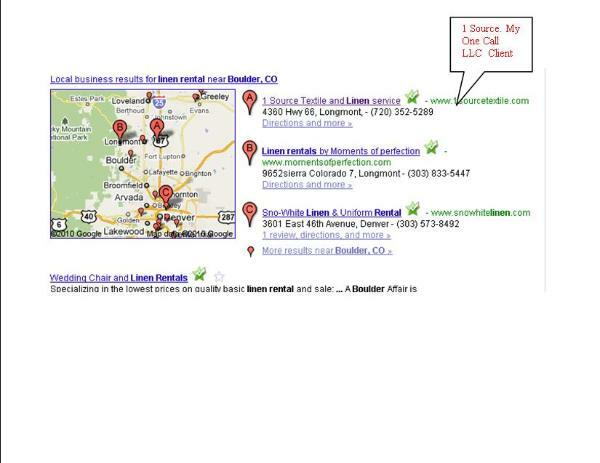 Why Google’s Geo Targeting in Local SEO is a Mess. A research paper recently stated that search terms using a local intent keyword (the city, or zip, or major metropolitan area as examples) where decreasing by 10% over the last year. Part of this trend may have to do with the search engines doing a better job over the last few years of displaying local information based on where they assume the searcher is located. In that, a large problem exists. Today Google thinks I am searching from Northglenn Colorado, while Bing thinks I am in Arvada Colorado. I am actually sitting in my home office in Lafayette Colorado. This can have a horrendous affect on my local searches, and I do a lot of local searches. Here is the screen shot of my browser showing Northglenn as my location in Google. 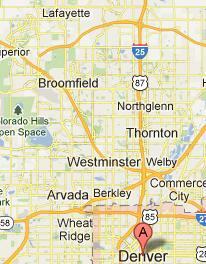 To save time I am not showing the Bing Screen shot, but trust me it says and shows Arvada as my location. Note the location on the left side of the screen half way down. Here is a Map of the Denver Metro area. Note that Lafayette (far north) is a long way (in local terms) from either Northglenn or Arvada. So, if I am searching for a local Plumber, or Chiropractic or Italian restaurant, Google and Bing will both show me results that are pretty worthless, unless I do add the local intent keyword (Lafayette). I haven’t been able to find any great statistics (consistent) on the number of local searches with a local intent keyword, and those that just use the keyword alone. But the experts and my experience seems to call it about 50% of keyword searches for a local service will have a city in it. What that tells you is 50% (or a large amount at any estimate) of searches for local services get poor results when it comes to the search engines local listings. Perhaps that’s why Google started using blended results so much more frequently over the last 18 months. They realized that many of the local searches where getting bad results. Google guesses at your location by thinking you are where your ISP local router, wire box or POP (old telecom term) is. That’s why they think I am sitting in Northglenn. A city I never go to or through. A few months ago they thought I was in Thornton Colorado. So not only are they wrong, but they even change how wrong they are every now and then. As a company that does a significant amount of Local SEO, and a piece of that being listings in Google Places (Or Google Plus for Business) Bing and Yahoo Local this can cause a real problem. If my local client in Lafayette Colorado wants to be visible in Maps for their area, then in reality, we need to somehow get the site ranking in Maps for cities 12 miles away. But that’s just for Comcast cable customers. If you’re with another ISP they may have you in another city. Pulling your hair out yet? So if Google is demanding accurate NPA information (as they should) for business listings don’t they then have a responsibility to provide accurate search information when someone searches for a local business? Seems simple enough to do, they can have a statement on any search with local intent saying “We show your location as ______ (city). If this is not correct click here to change your location settings. Until then, both Local SEO companies and their clients need to be aware that a top Maps listing in their area, may only be getting served by the search engines in locations far- far away, and have very little value. And we don’t even need to go into the Pay Per Click Ramifications, or at least save that for the next blog. So, if you would do me a favor, feel free to add a comment below, and list the city you are sitting in, and then the city Google shows you in based on your browser. This might be very interesting. If we can help you as a business with your web visibility, or if you are an SEO as a sales consultant, please call me at 303 500 3053. Local SEO’s love this report, and will invest a large amount of time reading and assessing each area they rate. I have always enjoyed reading the opinions of the some of the largest and best SEO firms in the world and comparing their thoughts on how important certain things are to your sites local ranking (Maps, places) to what I have seen over the year. Question: H0w Important are Citations to ranking? Traditional the consensus has always ranked “Citations” as one of the most important ranking factors. Once you get past the obvious factors of the address, claiming a listing, and the categories you use, it’s the top dog! And in 2009 I think that was true. 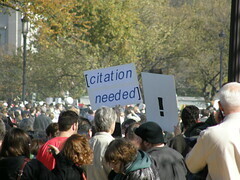 Answer: Citations just are not very important any more! Here is my prediction, and the reason behind it. The number and quality of Citations ranking factor will drop from very important to just important, maybe as low as number 8 on the top 10 factors. Now here is my opinion based on what I have seen and bloged about for a year. Citations are close to meaningless for ranking factor. And all of the local SEO companies who are still chasing citations are 14 months behind the curve. All of this changed in October 2010 and has continued to change with all the panda updates through out 2010. Today, your local rankings are based 98% on the same factors that you use in organic search Engine optimization, once you get past the already stated factors of having a local listing, and making sure you fill it out correctly. In a nutshell, it’s not a citation that makes any difference, it’s the quality of the page that listing and link (if included) is on. A very well respected SEO blog (and deserving so) recently published the top 100 (I think, may have been 200) citation sites. So today and next week, and next year local seo’s will be taking their clients money and using a bunch of these “Top 100” to try and increase their clients ranking. What a waste. In the vast majority of cases, Google only looks at the page the citation is on and that specific pages value, not the domain. So when your site is listed on (Pick one of the top so named citation sites) if the page your site is on has no or low P.A. value (Page authority as published by SEOmoz) or any of the other page quality tools you want to use that look at number of inbound links, and number of out bound, SEO juice from the other pages, and all that) then you have wasted your time. The bad news is the vast majority of the “top Citation Sites” fall into a low or no PA value for the page you end up listing on, and right now, because the mainstream SEO’s have not caught up to this lot’s of businesses are wasting a portion of their dollars on tactics that have not worked since 2009. So why would I publish this, when my competitor’s read this blog, and it can be a great help in their business? Because I truly do believe that what helps one business helps all businesses, and that the small business clients they have will benefit through this information. But then again, I could be wrong, as most everything in SEO is an opinion. I do feel confident in this information, as since we changed our strategies and tactics to reflect the new local search world, we have seen a 100% first page top 3 ranking for every client. Help me, help you, help me, help you. The Difference Between Local SEO and Organic SEO? organic results listed above the Maps, and some had a mix of maps and organic. claim your profile, complete your profile, get good citations. ranked. One doesn’t even have a web site. So we are comparing the highest ranked Places accounts in average to very competitive categories. scores are the major factor in Google places rankings. Before October 2010, this was not the case. compared to Places ranking and a few other tidbits. We will keep you posted on results as we understand them. We get a lot of questions about what sites to add that are good for Google Local Citations. Even with the recent changes to Google Places (not showing citations anymore) there is a considerable amount of belief that adding a “citation” link to your back link’s can be helpful in your Google Places rankings. In our experience, adding sites for the primary purpose of gaining a citation had lost most of its value last year. We don’t make this statement out of simple opinion, but based on assessing local web sites places rankings for over 4 years. For a brief time we thought Google may have just stopped indexing the deep pages associated with many of the common citation sites people would use. An example may have been a listing on Merchant Circle. Merchant Circle was built around (according to their PR) getting a local site ranked higher and bringing it more local traffic. I am not picking on them, there are hundreds of on line yellow page sites, and directories that web masters, SEO’s and others used for adding citations and trying to boost their sites rankings in Local directories. The truth seems to be; today those sites have almost no value in bring your local site traffic or rankings! But Google does continue to index these pages. One difference between a year ago and now (August 2011) is many of these citations don’t show up as a link in our back link reports. And it’s not that we use just one back link reporting tool, we use 5 different tools, because you get different information from each, depending on their methodology on how they acquire the back links to a site. We also do manual checks to as a final scrub so to speak. So those lead us to looking at it in a different light. That being, more from a link value stand point, than a citation value. So what happened? And how can we learn from it. Our opinion is pretty simple and falls in line with the basic principle that Google is looking for the best quality sites for a keyword search. We think this started in the Local search area with last October’s update when Google changed significantly how a Local Maps listing was ranked, by blending the organic ranking factors into the Maps results, or to be more accurate, by weighting those factors far more heavily. And these local ranking factors have continued to evolve with the Panda updates this year. Here is our thought. Pre Google changes the domain authority of the site you had a citation or link on was far more important than it is today, with the Page authority having less importance. Let’s take a completely made up model of that. Your link appears on a P.R. 7 site. ( I know PR is not the metric to use and we don’t, but it’s the commonly understood vernacular of basic SEO) and your site appears on a page that has no external links to it or any real ranking authority of it’s own. In the old days it was clear your site still received some value based on the domain authority. Lets call it a formula like this. Link value equals: ( Domain Authority / 2 )+( Page authority / outbound links on page). DO NOT TRY AND ANALYZE THIS FORMULA. I made it up and its only supposes to show that the domain had a higher influence on the Link value. We think today Google is primarily looking at the page authority of your link or citation, and has discounted significantly the added value of the Domain Authority (P.R., or SEOmoz DA) . So a link or citation is as good as the Page it’s on, not the Domain it’s on. Is it really this simple? No! Those people at Google are smart as a whip as my Mom use to say (I still don’t get that saying, or was it sharp as a whip, or tack? ) But for those of us who work on web visibility and promotion, it’s a good guide, and it’s working for us. And it is in complete harmony with Google’s public position on why sites rank well. More on that statement later. Like all opinions on what makes a web site rank well, this is just an opinion. It does seem to be proving accurate to the extent we can test it with our web promotion programs. We would love to hear from others on what they see as important ranking factors. Remember our Golden Rule of SEO. If you would take a certain action irregardless of how it will affect your sites ranking, and only because it will give your site better traffic and visibility, it’s a good thing to do. If you are taking an action solely for the perceived value it will bring in your sites ranking, it’s not going to help long term. P.S. (Bad news for all those marketing companies promoting that they will add a link to your site on 100 P.R. 7 blogs for $7.00. huh? 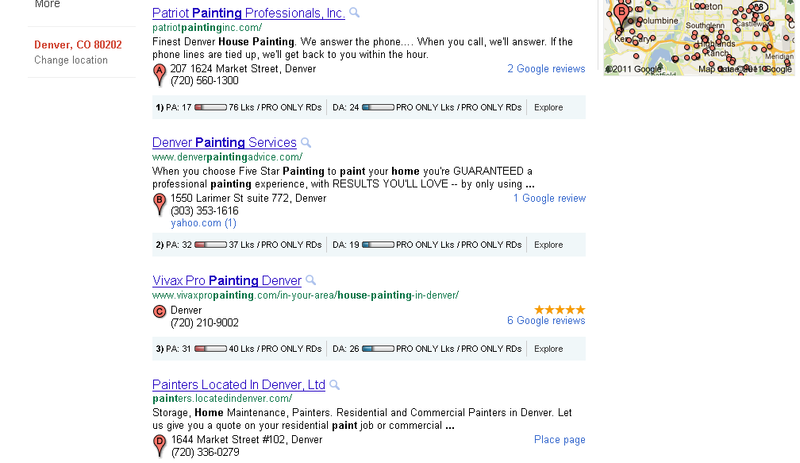 Having your site rank highly in Google places is important. Many of the traditional (if one can use that term) tactics for SEO help a great deal. One of the big differences is with organic SEO you can truly target many keywords. In maps, Google will decide what search terms get a map and which do not. So organic seo will help with a lot of search terms even if Google does not show a map. In searches where a Map is displayed, you will need to have a Google places account, and it is smart to claim it, and fill it out, so when prospects go to the places page, they will want to contact you. Stellar energy Contractors, different divisions. As we have been blogging about from time to time, Local SEO changed last October, when Google decided to mix both a sites organic rankings and Maps placement. We had always used both Local directories as well as organic SEO to get our clients better Internet visibility, but for the “Local SEO” firms that where just using Local only tactics, the changes must have had a negative effect on client rankings. So what do yesterdays changes mean to Local SEO? Nothing. It’s still the same premise. Do great promotion and visibility programs for your site. Don’t try to keep up with every change Google makes (it will drive you crazy), just use sound marketing and promotion principles to get the right people to your site. As this post is getting a great deal of attention and is ranked number 1 on Google for “Google places Changes” I thought I should add some additional content that might be of use to someone interested in the subject. I am assuming you are either a SEO or a business owner manager involved in the on-line promotion of your site? Best current Local Maps (Google places) promotional tactics. First, don’t fall in love with Maps. Organic SEO on local intent SER can do as much if not more for you. Remember only 30%-60% of searchers are searching with a local intent term. The others are being served local sites because Google assumes they are looking for a local company. Second. Citations are dead. This is my opinion, but watching and assessing rankings for new clients seems to strongly suggest that building the old Citation links and mentions is a complete waste of time. Only add your site to local directories that will actually bring you traffic! Here is our YES list: Yelp, Angie’s, local Better Business Bureau, and your chamber. Also any niche directory’s with less than 10 0r 15 listings can be very valuable. Don’t pay for listings! Third. In the beginning your physical address has as much to do with your local ranking as anything. The address of your company and its proximity to what Google considers “city center” is a huge factor. Also, make sure your address(s) are displayed on your home page and contact page. As your site gains better trust and SEOmoz page authority your physical address will become less of a factor. Make sure Google knows what cities you service by using your Google places account, and mention this on your site. Fourth. Using SEOmoz page authority as your guiding light is the best method for improving your rankings on Maps and organic. Combine the other tactics I am talking about with high quality back linking and content is the only way to improve your rankings that I see consistently work. Fifth. Link’s and mentions from other local site’s are highly respected with Google. Get your associates to mention you on their sites. Sponsor a local charities page, write real reviews of your local vendors that they can post on their site (include your Company Name Address and Phone, as well as your www if they will do that. Eight. Domain names matter. So do Company names. Yes, I understand that if you have been in business 10 years you can not change your name, domain and address. Or can you? If it’s a new campaign, go ahead and start with a keyword based domain name. Nine. No follow links are good. You hear a lot that no follow links pass no link juice (or whatever). The point is to get your site promoted, so if a site is no follow, but can bring you good traffic, use it! Twitter, Face book, most wordpress blogs are no follow, but have great traffic and, do you really thing Google is just blindly following the instructions of the site owner for what link is trustworthy and what link is not? Please. Ten. If you are going to work on your sites ranking and visibility, you are going to need to put in the time to do it. Figure an hour a day for 3 months. That’s 60 hours of sometimes productive, and many times non productive time, some one has to invest. And then the golden rule: No one thing is going to put you in the top of a Google Places search. I think you would agree, that all of the tactics I talk about are just good old fashion P.R. and promotion. Use this mind set… the P.R. mind set, what can I do to get my site (businesses/services) seen and noticed by the largest group of prospects possible. And once I am noticed, what is it they are going to experience? Putting all this work into a poorly developed site is a pretty big mistake, I had three restaurants I owned years ago and did a BIG radio promotion selling any thing on the menu for .79 cents on a Saturday morning. It was a disaster of course, we had a line out the door, and ran out of half our items. Service was slow, and the product went out lousy. Not only did the promotion not work, it hurt us! The best SEO advice? Build content your prospects want to see. Recently there has been a great deal of discussion on the SEO forum’s and professional sites about how the Google Map rankings are changing. Google places rankings now are based more on organic SEO than maps criteria. There are two elements that remain important that were and are unique to Places. First, and I know this sounds like I don’t have to say it, but you need to list your company in Google places if you are not there now, and fill out the profile with good categories. Two, the address of your business as it relates to the city center still is important. After that, We use to add a bunch of known citation sites. Most of those don’t even show up as a citation any more, and many don’t even show up as a link. I wouldn’t forget citations, but I would down grade their importance a bunch. Now it’s all about standard organic optimization. Get your home page up to speed (easy) and then add quality content to your site, and then add links from quality popular sites. The best way we have found to determine how strong your site is (from an SEO prospective) is to use the free tool bar from www.seomoz.com If some or all of this is above your head, but you want to learn, SEOmoz is a great resource, as is SEO book and Majestic SEO. Once you have it downloaded it will give you a Page Authority rank for any page you are on. It’s called PA and you need to see how the sites that are ranking above you ranked on PA, and then look at yours. Many sites that have had very little attention will be around a 10 PA. In most local categories you will need a 25 to 40 PA for your site to get on the front page. You can learn how to add ranking to your site at any of the sites I listed above. I use the rule of thumb that you will need 10 hours SEO to get from 20-30, and 40 hours more to move from 30 to 40. If you follow with that logic you are looking at 120-160 hours to move from 40 to 50. And of course, if you are a beginner Triple the time, as you will be learning as you go. Most SEO companies charge at least $100 to $150. an hour. If you do the math, you can then decide if SEO is viable option for your business. We have other options as well, including SEO management consulting, where we work with your employee to work through an SEO program. And we do the complete SEO programs for you as well.